Lactose, a milk sugar, is removed from whey during the concentration process. The United States produces several types and grades of lactose products to meet the varying functional and nutritional needs of end-users. U.S. suppliers can also formulate custom products and blends. This section discusses the different types of lactose, its functional characteristics, and some of the many applications for this versatile ingredient. A track record as the world's largest producer and exporter makes the United States a trusted, go-to lactose source for feed, food and pharmaceutical uses. Global customers rely on U.S. lactose for quality nutrition, product functionality and consistent supply availability. The United States produces food, pharmaceutical and industrial grade lactose, each with its own set of specifications. Learn about key applications and usage ideas for U.S. lactose in foods, beverage and pharmaceutical products. 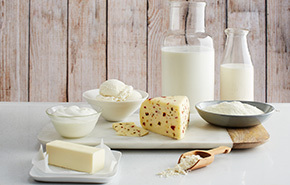 Explore the functional benefits of U.S. lactose as a food ingredient such as browning, shelf-life extension and more. Lactose generates a prolonged energy supply, increases mineral absorption and contributes to a healthy intestinal flora. A collection of downloadable and printable publications and materials is available to global customers who wish to further their knowledge and understanding of the functional and nutritional benefits of U.S. lactose and other dairy ingredients. Check out these valuable resources! Access this in-depth technical guide on using U.S. lactose. Available in English, Korean. Get this handy reference on lactose ingredient specifications. Learn how U.S. lactose enhances confectionery applications. Available in English, Chinese, Korean. Visit the Formulation Database to find prototypes that feature lactose. Hundreds of innovative ideas are at your fingertips. Have questions about U.S. lactose? Find answers under our Common Questions page.